'Tis The Season (Deck The Halls) (arr. Michael John Trotta) partitura de Christmas Carol está por debajo. 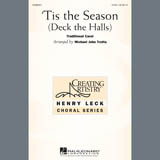 Tenemos 1 arreglo de 'Tis The Season (Deck The Halls) (arr. Michael John Trotta) Voz Partituras.